Providing systems that are able to capture, transmit, display, record and control images using digital video streaming technology as a basis suitable for application such as TV walls and digital signage. Delta’s video streaming system is built on an Ethernet network. It can capture any video signal, encode it, compress it, and then transmit it through the network to display on any specified monitor or location, including full screen display of a single signal source, multi-signal blending display on a single monitor or cross-monitor display of a single signal source. 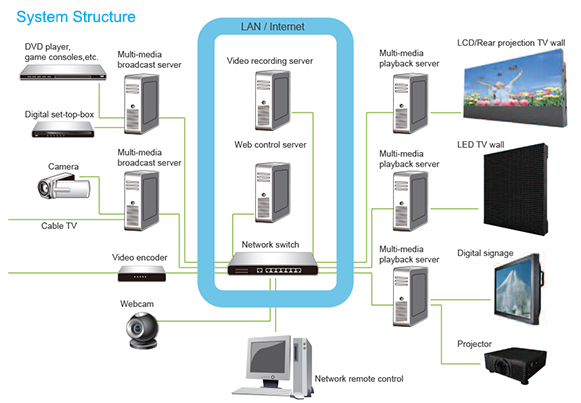 Delta’s video streaming system consists of four parts that include a multi-media broadcasting server, control server, recording server and a display server. In addition to providing HD quality video streaming under Gigabit high speed LAN, it can also pass through firewalls and import remote webcams or other signal sources into the system through the internet. Servers spread out in various locations can be connected using existing Cat5e/Cat6 network architectures, vastly reducing the cost on wiring and space configuration. It also provides a hierarchical web control interface, which also allows you to control this system using any number of mobile devices at any location in the network through the internet. It has various video compression formats and capture functions and uses high quality network broadcasting technology to send videos to network clouds. Able to playback various streaming source formats, the video can be displayed on monitors through cross-monitor playback and split-screen. Provides humane web interface management and control functions with intuitive graphical operations and management. Real-time recording of high quality streaming video that allows remote downloading and playback.